Reading to Logan is one of my favourite things to do with him. It’s great one on one time and there are so many benefits to reading to our little ones. Yes, there’s the obvious exposure to books to help them learn to read and write, but there’s also so much more than that. I’ve recently met with Kyla from Pippins Press and we’re working together to show you 5 benefits of reading to children and give you a chance to win one of her beautifully illustrated and hand-bound books, Milly the Naughty Pony. Read to the end for details of how to enter! Pippins Press creates beautiful children’s books. They have cute stories illustrated and written by Kyla and are hand bound with an attention to detail with coloured pages and raw edges. They’re works of art in their own right and are a great way to teach children to appreciate craftsmanship while you spend one on one time reading to them. Reading books to our children exposes them to language we may not use on a regular basis. In reading Milly the Naughty Pony there were many words and ways of describing things are outside of my day to day vocabulary. Hearing these different words and ways of speaking help expand your child’s vocabulary and develop their language skills. In a time where our attention spans are decreasing, I think it’s important to expose our children to activities that lengthen their concentration time. Reading is one of those activities. It forces them to sit (mostly) still and pay attention to a storyline by following the pictures and reading along. 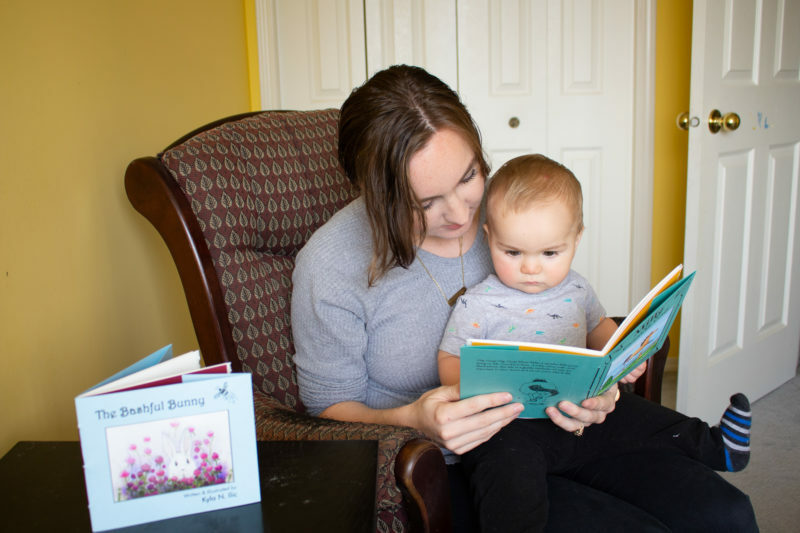 The benefits can begin when your lo is less than a year old and they begin to learn to turn the pages and follow along left to right. Their imagination can start to run wild imagining the different characters and settings of the book as you read to them. You can encourage this by asking them what they picture a certain character looks like, or what they think may happen on the next page. When children can imagine themselves in the character’s position and read about how they feel in certain situations, it helps develop their empathy. They can better understand and relate to different emotions. In Milly the Naughty Pony, children can relate to how the other farm animals feel when Milly eats their dinner. It teaches them to think about how their actions can affect other people and to empathize with them. One of my favourite benefits of reading to children is that it builds your bond with them. This is especially beneficial for working parents and parents that are away from their children for any long amount of time. When you read to your child you can cozy up next to them and enjoy a story together. You can help answer questions and truly enjoy being in each other’s presence. You can enter to win a Milly the Naughty Pony hand bound book and a beautifully illustrated greeting card by visiting my Instagram page. Contest runs from November 14th – 16th, 2018. Pippins Press has unique books that help teach your children about craftsmanship while enjoying the many other benefits of reading. Visit her shop to purchase a book for you or as a gift. There are many other benefits of reading to children, but these are 5 that I think make a great impact and are part of why I love reading to my little guy every single day. We normally spend our reading time cuddled up on the couch throughout the day. How do you like to spend your quality reading time with your family? How cute!! Definitely something I want to do when I have children. I’d never thought about learning empathy through putting yourself in a character’s shoes, it’s such an interesting benefit! The Maiyaan CHEETAH BACKPACK having Leopard AOPs design. This backpack can carry 15 inch laptop and front pocket with organizer to carry your other stuff.